A three-part series focusing on fraud modeling: pre-modeling, modeling, and post-modeling. Why I’m looking forward to representing a truly world-changing AI-powered fraud solution. We spoke with six women at DataVisor about their careers, their accomplishments, and the opportunities and challenges of life in Silicon Valley. DataVisor’s singular combination of ethical mission, visionary talent, and cutting-edge product, made this writer’s next career choice an easy one. 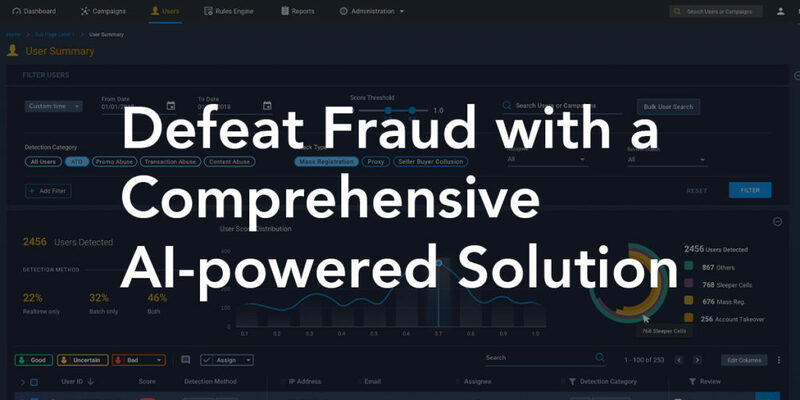 DCube is the complete AI-powered fraud management solution that puts control in the hands of fraud and data science teams to proactively defeat emerging fraud. Bot-powered credential stuffing attacks are coordinated, automated, and massive in scale. To prevent ATO of this type, advanced fraud management is required. Synthetic identity theft - when a fraudster creates a composite identity from a mix of real and fake information and applies for loans with the identity - is a growing problem for financial institutions. Are Mobile Devices the Leading Target for Fraudsters? Fraudsters are constantly finding ways to commit fraud through the mobile channel. This post highlights the techniques and methods they use. DataVisor's CEO Yinglian discusses the biggest trends in digital fraud from 2018 and makes predictions for what 2019 will bring. There were 944 data breaches in the first half of 2018 alone, compromising 3.3B +data records. Learn how fraudsters use this breached data to monetize the breaches and inflict damage. This blog post highlights several recent data breaches explaining how each breach happened and the number of consumers impacted. The holiday season provides fraudsters a perfect ground to attack. DataVisor’s Unsupervised Machine Learning can help buyers & sellers in marketplace. This post provides a few details about synthetic identity fraud and S.B. 2155, including what businesses should expect when it comes to the rollout of the law. Application fraud is sophisticated and legacy systems are unable to combat it. DataVisor’s Unsupervised Machine Learning identifies hidden attack patterns. With Supervised ML becoming increasingly commoditized, businesses are often left with various components rather than a solution that provides real value. The first step for fraudsters to commit an intended fraud on a given platform begins with fake account creation. Learn how AI and Machine Learning can help reduce fake account creation. The fraud landscape within the mobile user acquisition space is very complex with many sophisticated attack techniques involved. In this blog post, we will cover the tools and techniques used by fraudsters and why it's difficult to detect them. Last week, DataVisor attended Money20/20 Las Vegas, the latest financial and payment technology conference of the year. Here are the top three takeaways from the event for fraud and risk teams. Evolving money laundering patterns are leading to huge fines and mounting pressure on FIs to become more vigilant. Learn how unsupervised machine learning and its inherent merits can help FIs to uncover hidden money laundering patterns and improve AML detection. Are your fraud analytics tools ready for unknown fraud detection? Here are the top five considerations and insights needed for a dashboard to provide actionable insights for unknown fraud. An SR 11-7 compliant validation framework includes 3 core elements: An evaluation of conceptual soundness, ongoing monitoring, and outcomes analysis. This blog post is part one of a two-part series that details the UA fraud problems in the mobile app industry. The series highlights the impact of the fraud problem, the tools and techniques fraudsters use and why UA fraud is getting harder to detect. Today's AML & Compliance leaders face dual challenges of increasingly sophisticated digital financial crimes and the threat of growing fines from regulators. Learn how AI and Machine Learning can help FIs detect more crime and better triage alerts. Learn about the latest trends and insights in the world of online fraud from our analysis of over 4 billion accounts from some of the largest internet properties and financial services in the world. This is the final part of a three-part blog post series highlighting some of the key things to look for when it comes to choosing a third-party fraud prevention solution. In this post, we go over topics such as adaptability, scalability, ease of integration, and flexibility in deployment options. This is part two of a three-part blog post series highlighting some of the key things to look for when it comes to choosing a third-party fraud prevention solution. In this post, we go over topics such as explainability, engaging visualizations, data privacy processes, and etc. This is part one of a three-part blog post series highlighting some of the key things to look for when it comes to choosing a third-party fraud prevention solution. In this post, we go over topics such as multi-layer protection, target use cases, global reach and data, etc. DataVisor's VP of Engineering David Ting discusses how DataVisor optimizes its AWS stack with spot fleets, dynamic instance launches, & RT cost tracking, all while protecting over 4B users from fraud at the AWS Summit Anaheim 2018. Preventing fraud and protecting users is integral to IT strategy and core to maintaining a company’s competitive advantage. Learn how IT teams can be proactive on the lookout for fraud and able to react to it at the speed it happens. As attacks grow in scale and velocity, businesses are forced to evolve their fraud detection methods from manual detection involving blacklists and rule engines to machine learning algorithms that can detect known and emerging types of fraud. This article highlights why existing fraud detection methods have limitations and more importantly a few reasons why unsupervised machine learning is gaining traction. DataVisor's Yuhao Zheng and Boduo Li share advanced techniques for managing thousands of spark workers to analyze billions of events at a time, including clustering workers and automated, optimized management of DataVisor's spark infrastructure. DataVisor's Ting-Fang Yen and Arthur Meng present a novel deep learning technique for scalable online fraud detection among billions of users. Technical Blog | Are Labels Useful to Unsupervised Algorithms? Does the fact that UML doesn’t require labels mean that there is no benefit at all to labels? If label data exists already, how can it be used to improve UML detection results? In this article we discuss how labels can be effectively used in UML detection, even if they are not required. Unsupervised Machine Learning (UML) is a topic that we get a lot of questions about here at DataVisor, because UML is at the core of our detection platform. In this 5-minute primer on UML, we start by defining the overarching field of Artificial Intelligence, then we drill down to the sub-field of Machine Learning, and lastly we discuss the various machine learning techniques, including UML, and when each ML technique is most effective. Chuck Thacker was part of the foundation of everything we know in computing and a major influence on our founders and our company. Thank you, Chuck Thacker. With the rapid popularization and development of the Internet, a cesspool of online possibility has opened for nefarious individuals with an eye for rampant security gaps. Wondering if your company has any crime rings sleeping among your users? Most will acknowledge that there are likely some accounts lurking here or there, but may not realize that it’s a big problem.